Carr Gomm is one of Scotland’s leading social care organisations. Everything we do is shaped by our core values of choice, control, interdependence, openness & honesty, and respect. We are a registered charity and not-for-profit company: we put people first. We are one of Scotland’s leading social care and support charities, striving to support people to achieve their individual hopes and dreams every day. We know our work is challenging and very rewarding, and we require people with a flexible and inspirational approach who are able to find innovative solutions with people, not for them. Carr Gomm’s Community Contacts provides an independent advice and support service to people who are interested in Self-Directed Support (SDS) by supporting them to identify issues that affect their ability to live well and ways to address these. Taking a person-centred approach, Community Contacts supports individuals to understand the values and principles of SDS and helps them identify personal outcomes and priorities as well as any challenges that need to be factored in. Community Contacts originally operated across Argyll and Bute; we have now secured Scottish Government funding to continue this work and extend into Highland. The 5 post holders will be home based, and we would aim to have at least one post holder in each of the 4 Highland planning districts – Central, North, South and West. Your core responsibility is to be the face of Community Contacts in your area of operation: to ensure that people are aware of their choices and rights around making social care decisions and in the delivery and management of their SDS option. Great communication skills are essential, as you will work alongside partners including other third sector and Health and Social Care colleagues. Carr Gomm is one of Scotland’s leading social care charities striving to help people to achieve their individual hopes and dreams every day. The Rosebank Allotment Project is part of our Community Development Team; the project is based in Kirkintilloch, East Dunbartonshire and uses horticulture and other group activities to provide opportunities for people with mental health and/or substance abuse issues to learn new skills, enjoy working in the outdoors, build relationships and further their own recovery. Our vision is that, as well as providing the best possible opportunities for people we support, the service is integrated within the local community and its resources, to work towards reducing social isolation for the people we support while also tackling the stigma around mental health and addiction issues. The Project Leader will work with individuals and groups, developing a programme of activities to help bring routine and structure back to their day; to help people develop new skills and to think and plan for their future. Our Community Project Leader will develop and implement a community project within agreed plans and budget, with the aim of continually developing the project and improving what it offers. In order for achieve this, the Project Leader will implement involvement and feedback mechanisms to ensure we shape the development of the project with support from everyone involved in the project. You will work with your line manager to promote, monitor and report on standards of service whilst liaising with other organisations and groups to develop activities in partnership. The role will see you facilitating group activities and organising events whilst providing advice and support to project staff. This list is by no means exhaustive but gives a flavour of the responsibilities undertaken by the project leader. We are looking for an innovative, proactive and organised leader who is excited by the opportunity to strengthen and develop our Rosebank service by engaging and inspiring the local community to support our cause. You will be an excellent communicator who is patient, positive and self-motivated. You should be able to capture an audience through your storytelling and find solutions to problems by thinking laterally. If you believe you have the skill set required to excel in this type of role, understand the positive effects that the combination of support, community development and outdoor activities can have on an individual’s health and wellbeing and have a love of horticulture then we would love to hear from you! If you would like any further information about the role please contact Lyn Ryden, Operations Manager, on 07739 976350. Carr Gomm is one of Scotland’s leading social care organisations. Everything we do is shaped by our core values of choice, control, interdependence, openness & honesty, and respect. We are a registered charity and not-for-profit company: we put people first, not profits. An exciting opportunity has arisen for a part time worker in Carr Gomm’s team of Specialist Link Workers. Based in the Rivers Centre in Edinburgh city centre, the successful candidate will work with PSP staff to ensure that adults, children, young people and their families are supported in a person-centred way and in line with Carr Gomm’s values to identify their aims and put them into effect. Whilst reporting to the Project Manager the Specialist Link Worker will offer first point of contact for people attending the centre and to support individuals to achieve practical tasks and arrangements as well as their ambitions. The aim of the partnership is to deliver Trauma Care throughout a person’s life using a public health model; broadening the focus of the trauma care system, to be holistic, including preventative and early intervention work. This will be facilitated by bringing key partners into a central site from adult’s and children’s mental health trauma services, social care and third sector partner support services involved in the trauma care pathway. The PSP aims to deliver holistic care across the lifespan, putting people at the heart of their own recovery. This is an exciting opportunity to apply for a Service Manager post in the Home Care service based in Campbeltown. Carr Gomm is one of Scotland’s leading social care organisations. Everything we do is shaped by our core values of choice, control, interdependence, openness & honesty, and respect. We are a registered charity and voluntary organisation: we put people first, not profits. The Service Manager will manage the support arrangements to be person-centred and consistent; manage and support team members; and liaise with relatives and other agencies. The role also involves maintaining financial viability of the service, service development and contributing to the local management team. The successful applicant will be able to promote Carr Gomm’s values and policies in all aspects of the role. You will have an understanding of developing support plans and risk assessments and putting these into practice. Good written and verbal communication skills required. Do you want be part of an exciting, creative and forward thinking organisation? The vision of Carr Gomm is that we all live in a society where everyone should have the support they need to make choices and to control their lives as citizens. We are currently looking for an energetic and passionate person to join our Administration Team to help us achieve our aims. Carr Gomm is a person-centred organisation that supports people to lead their lives safely and to do the things they want to do. We provide support across Scotland for people with varying support needs such as mental health issues, autism or dementia and help them in day-to-day living, in planning for the future and in realising dreams. The role of Administration Officer is based at our National Service office in Craigmillar, Edinburgh. As part of the administration team you will assist in developing and delivering Carr Gomm’s systems, processes, policies and procedures for all aspects of our work. We are looking for a team member who is able to work confidently, accurately and able to use their own initiative and who share our values of respect, interdependence, choice, control, openness and honesty. We particularly hope to hear from people who have sound IT skills, have a proactive approach and the ability to respond creatively to challenges. 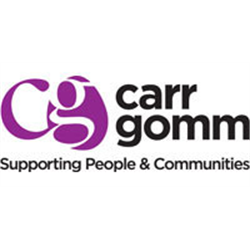 The benefits of working with Carr Gomm include; 35 days’ holiday per year and a sell-back annual leave scheme; enhanced maternity, paternity, adoption and sick leave; a Defined Contribution pension scheme with incremental employer contributions; membership of a credit union; cycle to work scheme; discounts with leading hotels and gyms; an employee assistance programme and employee discounts.